I had attained to that supreme degree of sensibility where the divine intimations of art merge with the impassioned sensuality of emotion. 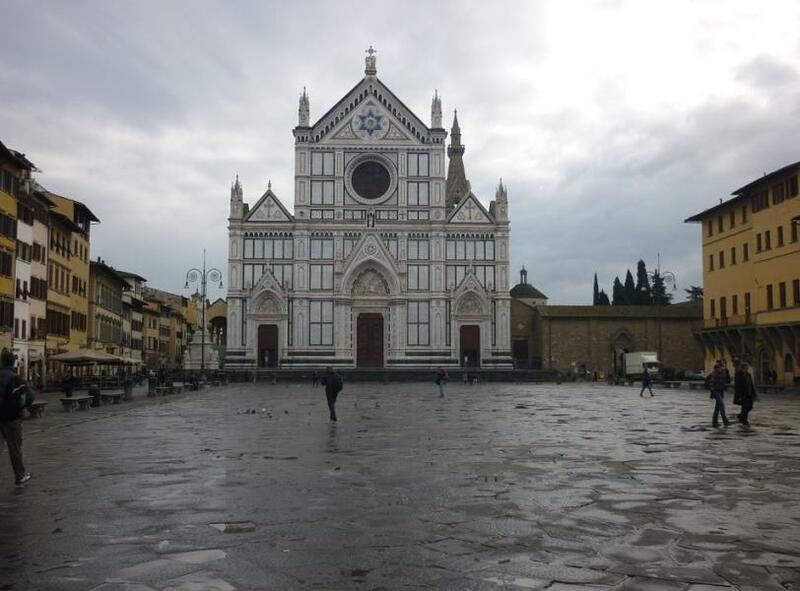 As I emerged from the port of Santa Croce, I was seized with a fierce palpitation of the heart; I walked in constant fear of falling to the ground. But don’t be put off; as beautiful as much of the art is, most people manage to emerge from a visit without tripping over themselves. Yet of all the façades grafted on to Italy’s churches in order to atone for the chronic Renaissance inability to finish any project, this is one of the least offensive. It does have something that most church façades lack: a Star of David, front and centre. The architect Niccolò Matas of Ancona (d. 1872), who taught at Florence's Accademia di Belle Arti was either said to be Jewish, and hoped his work on the church would earn him admission inside its pantheon of Florentine greats, but because of his religion he lies buried under the porch. 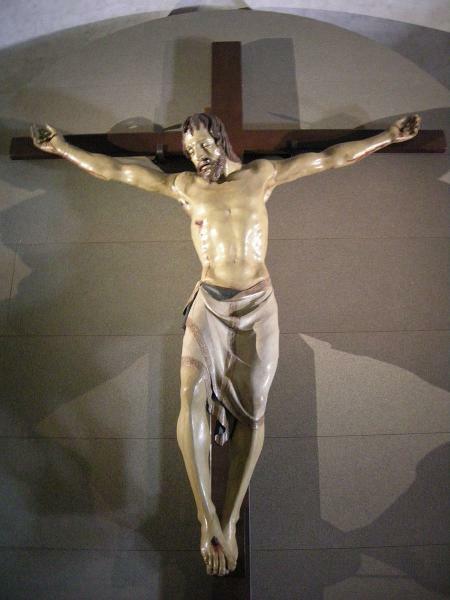 Others say no, he was Christian, and the Star of David has long been used by Catholics, and that inside the star is a symbol of Christ and Matas is buried outside because he intended the entire façade to serve as an elaborate tombstone. Santa Croce was reputedly founded by St Francis himself, and it’s probably true; during repairs after the 1966 flood, vestiges of a small early 13th-century church were discovered under the present structure. It went by the board in the colossal building programme that changed the face of Florence in the 1290s. The great size of the new church speaks for the immense popularity of Franciscan preaching. Arnolfo di Cambio planned it, and it was largely completed by the 1450s. Unfortunately, just as in Santa Maria Novella, Giorgio Vasari and the blinding forces of High Renaissance mediocrity were unleashed upon the interior a century later. Vasari never had much use for the art of Andrea Orcagna – he not only left him out of his influential Lives of the Artists but in Santa Croce he destroyed Orcagna’s great fresco cycle that once covered the nave, replacing it with uninspired side altars. Like many Franciscan churches, Santa Croce’s large size, its architectural austerity and open timber roof resemble a barn, but at the end there’s a lovely polygonal sanctuary, which shimmers with light and colour streaming through the 14th-century stained glass. For centuries it was the custom to install monuments to illustrious men here but, perversely, the greater the person, the uglier their memorial. A member of the Pazzi conspiracy, Francesco Nori, is buried by the first pillar in the right aisle, and is graced by one of the loveliest works of art, the Madonna del Latte (1478), a bas-relief by Antonio Rossellino, while the Tomb of Michelangelo (1570, the first in the right aisle) by Vasari is one of the least attractive. Michelangelo died in Rome in 1564, refusing for 35 years to return to Florence while alive, but agreeing to give the city his corpse. Dante has fared even worse, with an 1829 neoclassical monument that’s as disappointing as the fact (to the Florentines) that Dante is buried in Ravenna, where he died in 1321. Facing the nave, Benedetto da Maiano’s marble pulpit (1476) is one of the most beautiful that the Renaissance ever produced. Behind it, the neoclassical Vittorio Alfieri Monument (1809) was sculpted by Antonio Canova and paid for by Alfieri’s lover, the Countess of Albany. 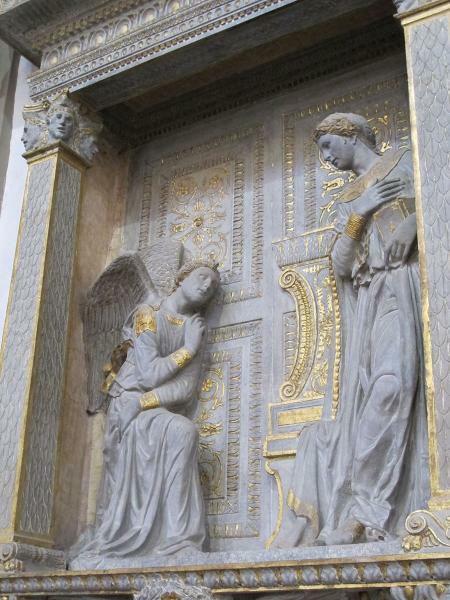 Next is the nondescript 18th-century Monument of Niccolò Machiavelli, and then Donatello’s pristine Annunciation (c. 1435), a tabernacle in gilded limestone and a dramatic change from previous, Gothic style Annunciations, with its far more natural figures and drapery inspired by classical art. The angel Gabriel wears a remarkably sweet expression as he gently breaks the news to a grave, surprised and very human Virgin Mary. Bernardo Rossellino’s Tomb of Leonardo Bruni (1447), another masterpiece of the Renaissance, is perhaps the one monument that best fits its man. Bruni, a good friend of Cosimo il Vecchio, was a Greek scholar, an eloquent humanist who urged the Florentines to be worthy successors of the ancient Athenians, and the author of the first major historical work of the period, The History of Florence (the book clutched by his tranquil effigy). The tomb, with its Brunelleschian architectural setting, inspired other artists, most obviously Desiderio da Settignano and his equally beautiful tomb of Carlo Marsuppini (1453), another humanist, located directly across the nave. It also inspired the more imitative monument to composer Giocchino Rossini crowded in next to Leonardo Bruni to the left. Last along the right is the tomb of Ugo Foscolo, the Greek–Italian poet and patriot. Santa Croce is especially rich in trecento frescoes, which provide a unique opportunity to compare the work of Giotto with his followers. The south transept’s Castellani Chapel has later, more decorative compositions by Agnolo Gaddi (Scenes from the Lives of Saints, 1380s). 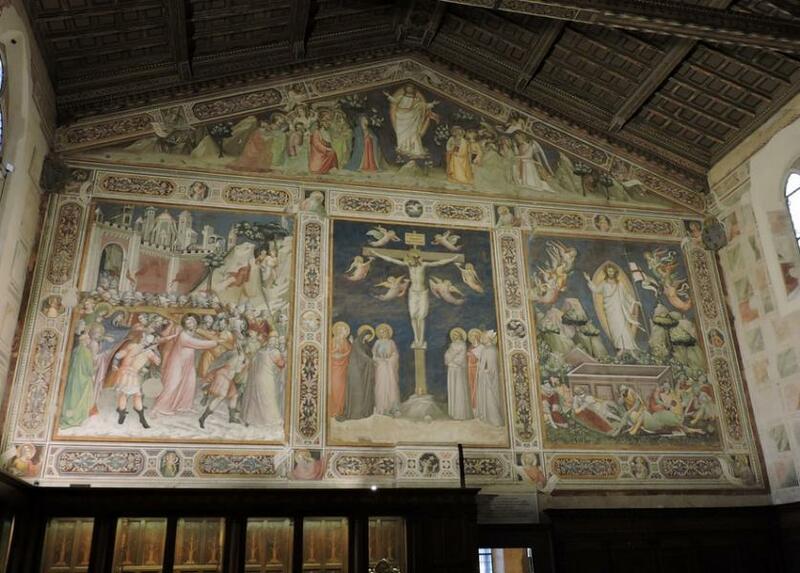 The beautiful Baroncelli Chapel was painted with Scenes from the Life of the Virgin by Agnolo’s father Taddeo, who served as Giotto’s assistant in the 1330s. 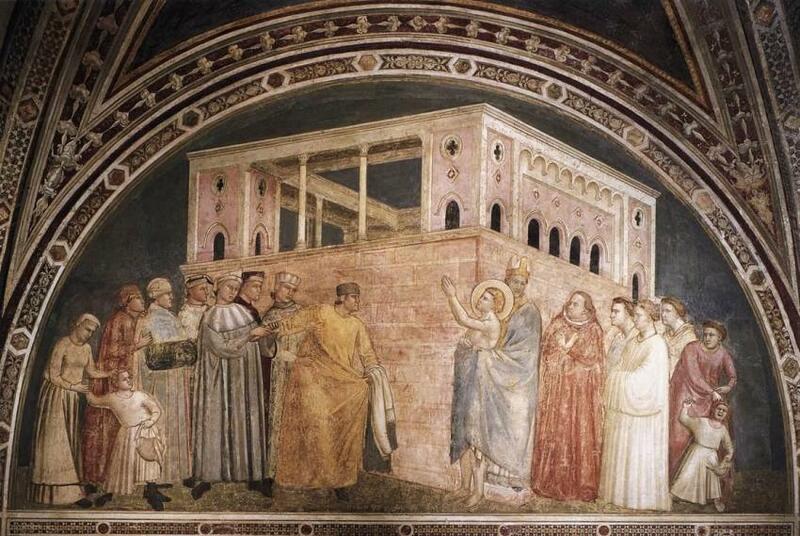 It houses a bright gilded altarpiece, the Coronation of the Virgin by Giotto and his workshop. The next door gives on to a Corridor and the Medici Chapel (open for Mass at 6pm daily), both designed by Michelozzo; inside are one of Andrea della Robbia’s finest altarpieces and a 19th-century fake Donatello, a relief of the Madonna and Child that fooled the experts for decades. From the corridor a door leads to the Sacristy, its walls frescoed by Taddeo Gaddi (The Crucifixion), Spinello Aretino and Niccolò di Pietro Gerini. Behind the 14th-century grille, the Rinuccini Chapel was frescoed by one of Giotto’s most talented followers, the Lombard Giovanni da Milano, in the 1360s. 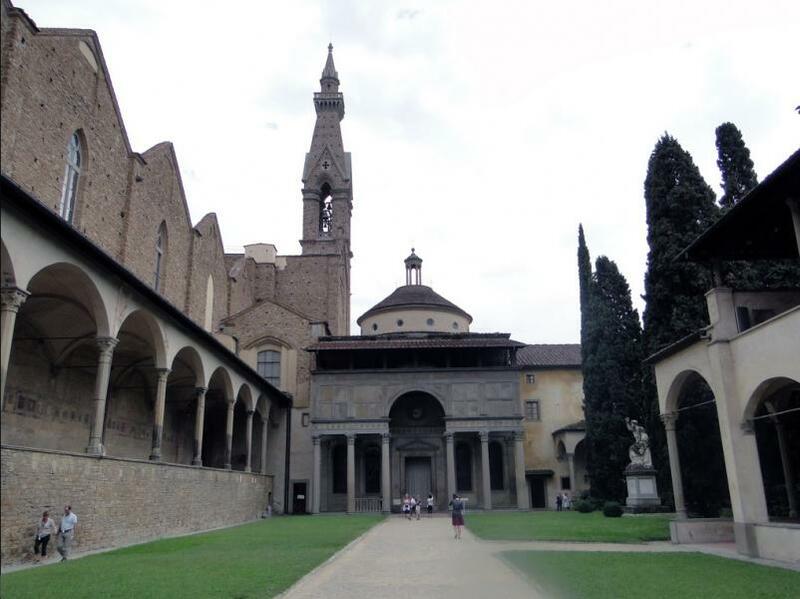 The two chapels to the right of the sanctuary belonged to the two richest families in Florence until England’s Edward III ruined them by repudiating his debts to their banks in 1339. Just before bankruptcy, however, they hired Giotto, Italy’s most famous and prestigious artist, to supply the frescoes. Giotto at the time was at the height of his powers, having just returned from Padua after completing his masterpiece, the Arena chapel. The frescoes have not fared well during the subsequent 680 years. Giotto painted large sections a secco (on dry plaster) instead of affresco (on wet plaster), presenting the same kind of preservation problems that bedevil Leonardo’s Last Supper. If that wasn't bad enough, the 18th century thought so little of Giotto that the chapels were whitewashed as eyesores. Rediscovered some 150 years later and finally restored in 1959, the frescoes now, even though fragmentary, look more or less as Giotto painted them, although minus much of their detail and finishing touches. The Peruzzi Chapel contains scenes from the Lives of St John the Evangelist and the Baptist. In the Bardi Chapel the subject is the Life of St Francis. The contrast between Giotto’s frescoes and the Bardi chapel’s 13th-century altarpiece, also on the Life of St Francis, is a fair yardstick for measuring the breadth of the Giottesque revolution. Ruskin, for his part, fixed his attention on the figure of St Louis, and spent breathless page upon page in his Mornings in Florence, praising it as the perfect example of Giotto’s style, never suspecting that the entire figure had been added only a few years previously by the frescoes’ restorer. Agnolo Gaddi designed the stained glass around the Sanctuary, as well as the fascinating series of frescoes on the Legend of the True Cross. To the left are more chapels frescoed by followers of Giotto: the fourth, the Bardi di Libertà Chapel, by Bernardo Daddi and the last, the Bardi di Vernio Chapel, by Maso di Banco, one of the most innovative and mysterious artists of the trecento. The frescoes illustrate the Life of the Pope St Sylvester (his baptism of Emperor Constantine, the resurrection of the bull, the closing of the dragon’s mouth and resurrection of two sorcerers); on the other wall of the chapel are a Dream of Constantine and Vision of SS. Peter and Paul. In the corner of the transept, the richly marbled Niccolini Chapel built by Antonio Dossi in 1584 and decorated with paintings by Allori offers a Mannerist change of pace. Next, the second Bardi Chapel houses the famous polychrome wooden Crucifix by Donatello that his dear friend Brunelleschi called ‘a peasant on the Cross’, according to Vasari. Donatello was ever the innovator, ever in search of a more realistic figures instead of ideal; Brunelleschi's response, a few years later, was his Crucifix in the great Dominican church of Santa Maria Novella that so astonished Donatello, according to Vasari that he dropped the eggs he had bought for their lunch. The last of the funeral monuments, near the door, belong to Lorenzo Ghiberti and Galileo; for falling foul of the Inquisition, Galileo was not permitted a Christian burial until 1737. Filippo Brunelleschi, who could excel on the monumental scale of the cathedral dome, saved some of his best work for small places. Unless you know something of the architect and the austere religious tendencies of the Florentines, the Pazzi Chapel is inexplicable, a Protestant reformation in architecture unlike anything ever built before. The ‘vocabulary’ is essential Brunelleschi, the geometric forms emphasized by the simplicity of the decoration: pietra serena pilasters and rosettes on white walls, arches, twelve terracotta tondi of the Apostles by Luca della Robbia, coloured Rondels of the Evangelists in the pendentives by Donatello, and a small stained-glass window by Baldovinetti. Even so, that is enough. The contemplative repetition of elements makes for an aesthetic that posed a direct challenge to the International Gothic of the time. Leaving the Pazzi Chapel (notice Luca della Robbia’s terracotta decorations on the portico), a doorway on the left of the cloister leads to another work of Brunelleschi, the Second Cloister, designed with the same subtlety and one of the quietest spots in Florence. 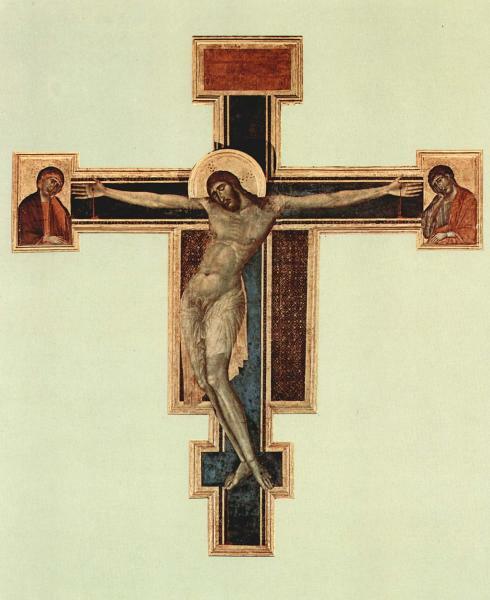 Located in the old monastic buildings off the first cloister, the museum's most famous work is Cimabue’s celebrated Crucifix (c.1265), famous for breaking the then-highly stylized Byzantine mold. Sadly devastated by the 1966 flood, it's been partly restored after one of Florence’s perennial restoration controversies. 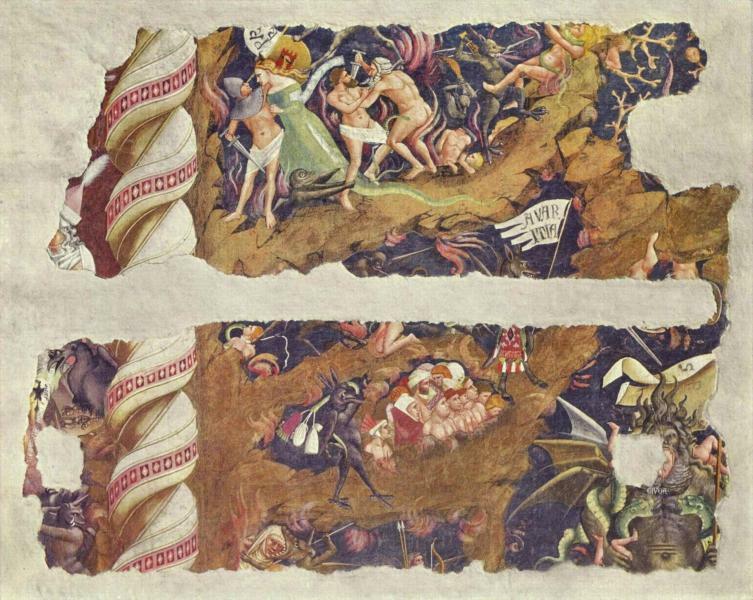 The refectory has another fine large fresco by Taddeo Gaddi, the Tree of the Cross and the Last Supper, while fragments of Orcagna’s frescoes salvaged from Vasari and company offer powerful, nightmarish vignettes in The Triumph of Death and Hell. The museum also contains works by Andrea della Robbia, the tomb of Gastone della Torre by Tino di Camaino, one of the few works in Florence by the Sienese sculptor, and a painting of Florence’s Mayor Bargellini with a melancholy Santa Croce submerged in the 1966 flood for a backdrop. Under the colonnade there’s a memorial to Florence Nightingale, born in and named after the city in 1820, while her parents were doing a Grand Tour of Italy. Another section of Santa Croce's Monastery houses the city's Leather-working School and shop Schola del Cuoio (entrance Via di San Giuseppe 5R). Adm €8, €6 ages 11-17, free under 11; family entries €8 for adults, free for under 18s. 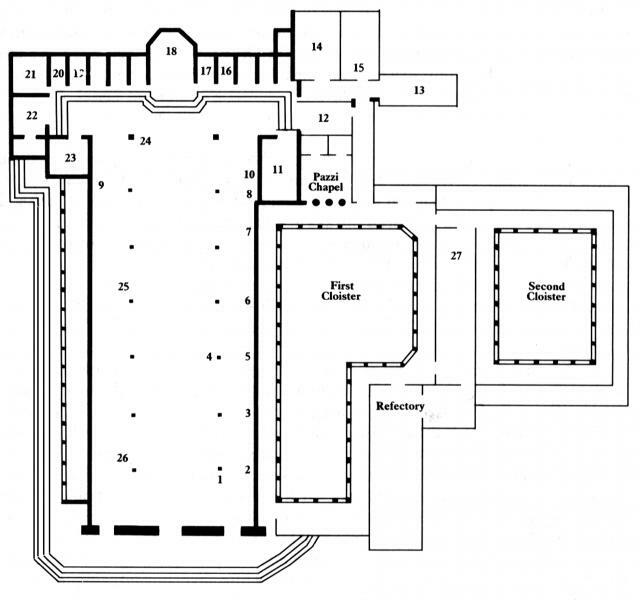 Includes the Basilica, the Pazzi Chapel, the Museo dell'Opera, the Refectory and the three cloisters. You can book dates and pay for tickets in advance for an extra €1 via the website.